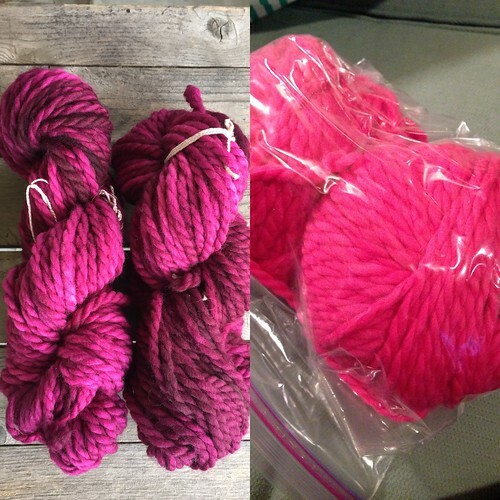 There is a yarn company (I won't name names but let's say it rhymes with "phlegm-getter") I have been writing about for over a decade. Their website could be renamed The Land That Time Forgot. 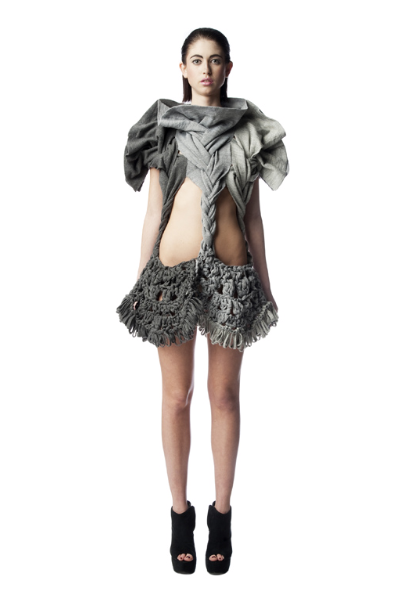 This collection I fugged in August 2005 is so nearly identical to their "new" designs I am agog. Again, the designs in this post are their NEW ones. They're still cranking out "capegrossas" and posing them identically. Still putting out the same over-sized cardigans in "fashion yarns." Did the design team eat a poison apple a dozen years ago and are now under a curse to create the same thing over and over? Dude, it is seriously time to think about switching tailors. Yesterday's dye day was very productive and I'm happy with most of the results. I brought yarns that I got at my November retreat. I chose them because they were yarns I love in colors I hate for ridiculous prices. These side by side photos aren't the greatest. The "before" shots were taken indoors at night just to get a reference photo into my Ravelry stash. 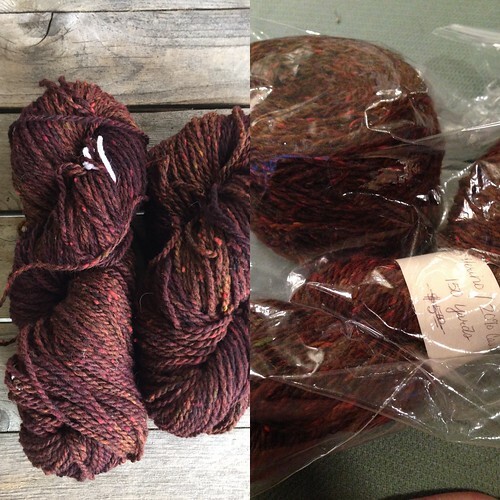 The first four were all thrown into the same dyepot with Jacquard Burgundy dye. I think I also added a little black? I'm a pretty loosey-goosey dyer. I just throw things into the pot until I like it. I also don't have much experience with these dyes. First up, a skein of Rowan Polar in a color I haven't enjoyed since the mid-eighties. Next is Tahki Baby in the most vile, vivid Pepto pink (not as hot as the before photo suggests). These are Bouton D'Or Ksar. 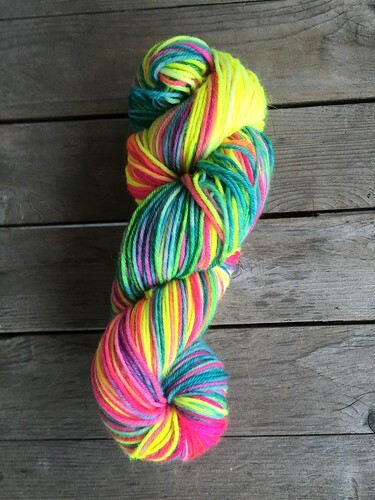 I love this yarn. It's 50/50 wool/camel. I loathe the original rusty red color. 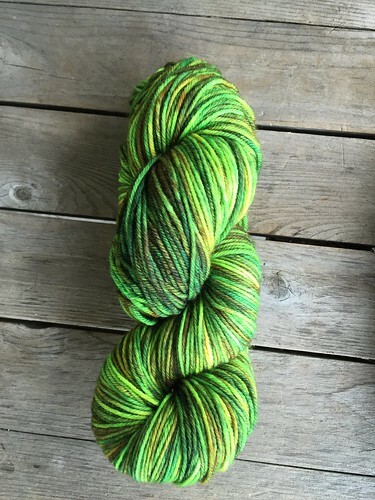 This is a mystery merino/cashmere blend. The yarn ended up in the middle of the pot and did not take up much dye. I think this will get another dye job. 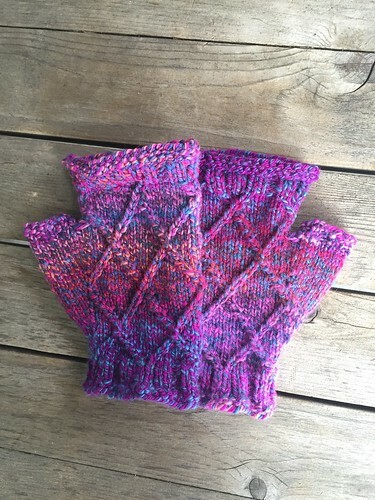 These last two skeins are Blue Sky Alpacas Bulky. 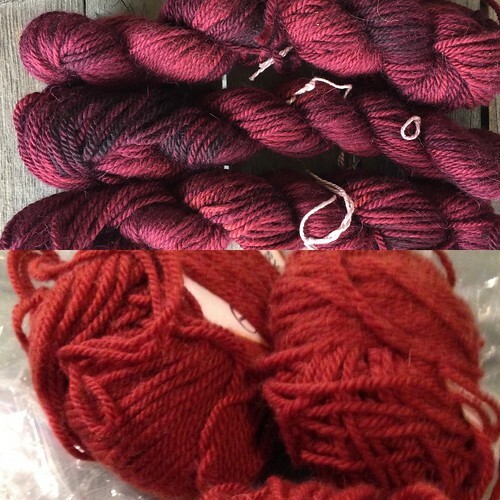 I got the two skeins for $4! The mustard yellow is possibly my least favorite color in the world. 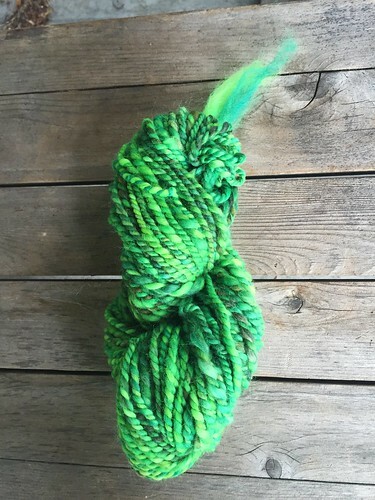 I overdyed with Black, Emerald and a smidge of Chartreuse. I absolutely love it now. 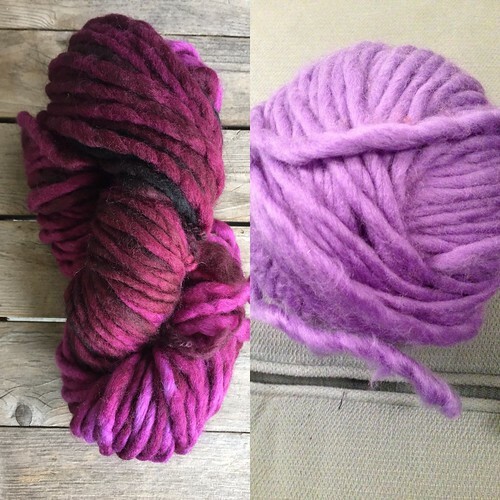 Do you have old skeins in colors you now hate? Throw them in some dye. You've got nothing to lose. Oh, whoops. That's embarrassing. 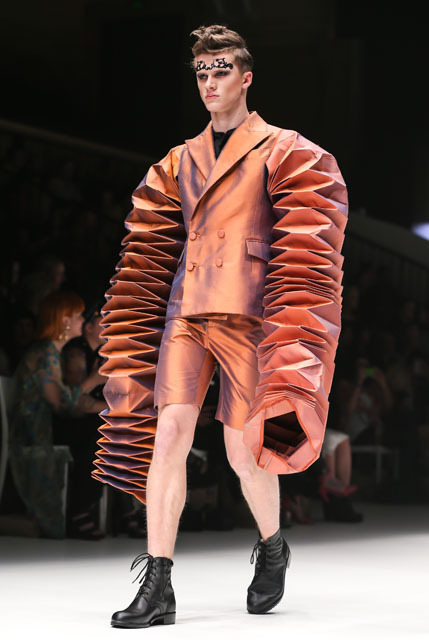 The designer got his runway and home collections mixed up. 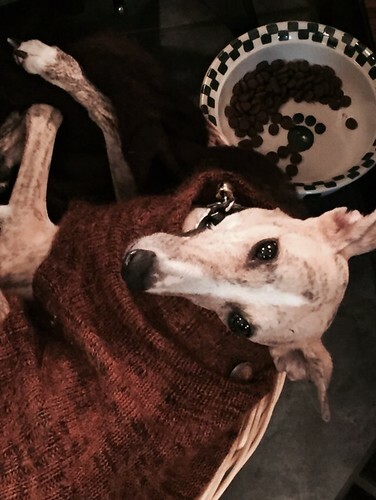 Right now his showroom has a queen-sized bed wearing a linen sweater, a sofa in cigarette pants and a window with a body con dress. Silly mix-up! Oh, that reminds me. I need to start another load of laundry. 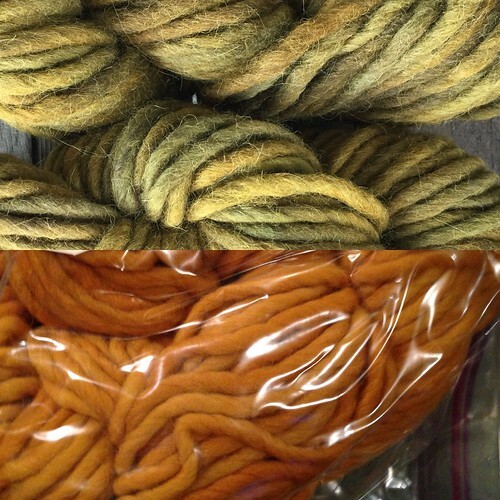 At the Whidbey Weaver's Guild Spin-In this weekend Judith Mackenzie gave a talk about color. I got me thinking about some old fleece that had been sitting in my stash for a very long time (the sales slip in the bag says 2006). 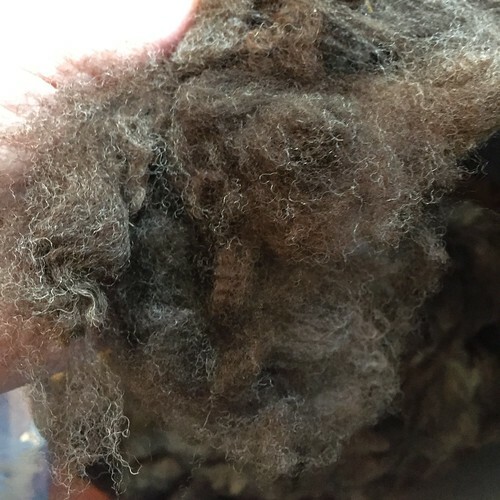 It's a small brown Corriedale fleece that I scoured when I first got and flick-carded, then set aside. I'm always drawn to variegated fleece but when you spin them they're just light brown. I thought I'd experiment with adding some color. I put small bits of fleece in three jars, added a little Dawn dishsoap (just a drop), water, vinegar and a drizzle of dye. 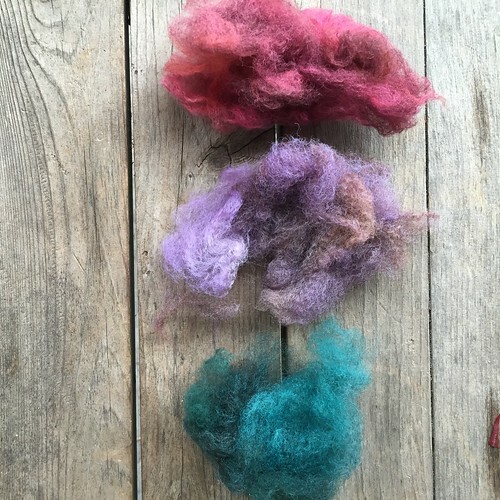 I choose Cherry, Violet and Cyan from my Mother Mackenzie dyes. I heated them in the microwave for a few minutes and let them sit until the water was clear. I was immediately partial to the violet. It allowed more of the original color through and seemed to work well with it. But you don't really know if a color is any good until you spin it. 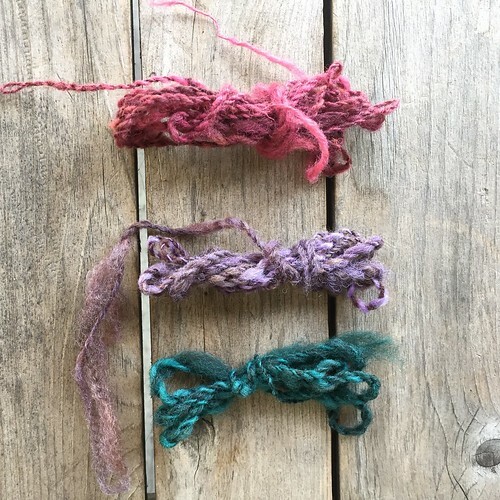 Since these were just little tufts of fiber, and I already have a project on my wheel, I pulled out a heavy old drop spindle that I never use and made a three mini skeins. I still like the Violet the most. It shows off the variegation in the fiber really nicely, brightening the lighter bits.